Hello again! I hope everyone is enjoying the beginning of summer and having a chance to get out and enjoy their animals. With the arrival of spring and summer, we have been working with a lot of young horses at the Harmony Equine Center. One of the biggest things we see is that they are looking for a leader, which is a part of the natural herd dynamic. Usually, the lead mare is an older, seasoned horse that the rest of the herd trusts. I find that when a horse is looking for a leader and does not find one, they assume that role, which can happen not only with young horses but with older horses as well. It is important that we establish ourselves as the leader of our horse herd or we risk poor behavior escalating quickly. For example, if our horses get nervous or become afraid, they will pull away from us or potentially ignore us and run us over. Another example might be that one horse views another horse as the leader and will only feel safe if they are around. Many of us have seen this behavior in horses, and it can be known as “buddy sour.” How can we establish leadership with our horses? The same way another horse in the herd creates leadership; moving their feet. If you have ever watched a herd of horses eat, the horse at the lowest end of the pecking order moves away when a horse above them approaches. Like any good leader, the horse will start by asking nicely, perhaps by merely walking over or pinning their ears. If the lower horse doesn’t move, the other horse might ask a little louder, maybe by rushing at them or by nipping a little. Eventually, the process works its way up until the horse moves. Soon, all the leader will have to do is ask nicely, and they can get their point across. We can do the same thing, start nicely by making a gesture toward the horse and work your way up. You may even get to the point you might need to tap your horse on the shoulder to get them to move, however, if you always start light, eventually that is all you need. 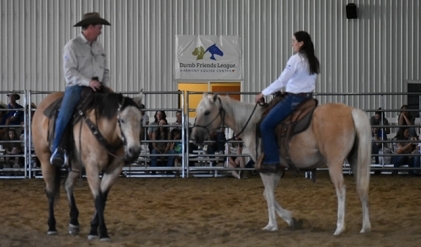 Practice moving your horse in all directions, including left, right, forward and backward. Round pens are helpful, but you can also do it on the end of a lead rope. Another aspect of being a leader to our horses is knowing where to draw a line with inappropriate behavior. This direction doesn’t have to come all at once while our horses are learning, but it is important to establish what isn’t OK and make that behavior difficult. A great example of this is halter training. When we are first haltering horses, they don’t know anything about following us. Most of the time, the horses aren’t sure we aren’t out to get them. They try to pull away, fight the halter and act wild at first. Our job as their teachers and leaders is to passively put pressure on the halter on one side or the other and wait for them to give even just a little bit. As soon as the horse feels the relief of pressure, they will start looking for it again and find it faster. In very little time, horses learn to stop fighting the halter and lead rope. We haven’t started leading yet, but we set some boundaries by saying “the time for you to run around and do whatever you want stops when the halter is on.” With some horses we can get leading right away; with others, just giving to pressure on the halter is good enough. Horses soon learn to appreciate that there are rules and start looking to us as their leader to establish them. It is important to provide relief when the horse begins to try, even if they don’t get it all right away. When we continue to be critical and demand more, our horses become frustrated and quit trying. It’s very similar to how we might respond. If we reward the try, we will create a situation where our horses are continually working for us. What more could we ask?